As a business owner the growing success of your business is likley to be something that you focus a lot of your time on - but you may also be on the look out for new ideas about how to achieve that. Below we have put together a few suggestions that might help you if you are trying to grow your business. They are not meant to be comprehensive but it will hopefully offer a few ideas that you might not have thought about. Lets take our own customers, invoice finance users or prospective users, as an example. 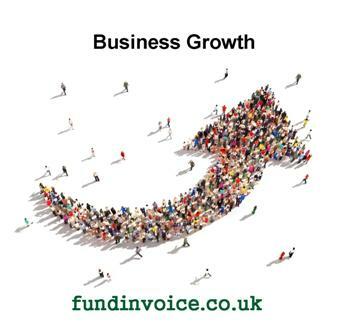 Approximately 1% of UK businesses use invoice finance. If you assume that the same amount again have the potential to use it, that gives us a target market of 2% of UK businesses. So that's 2 out of every 100 companies that we meet, or speak to. So if we went to a random business networking event, with say 25 companies present, we would need to go to 2 events in order to meet 1 prospect that we could market our services to. Similarly, if we commissioned a TV advert, it would be broadcast in the main (at huge cost) to numerous parties outside of our target audience. These kinds of approaches would not suit our kind of customers. If we were selling mobile phones we might say a potential market is almost 100% of the population, hence we could consider methods of marketing that were "scatter gun" in their nature e.g. TV advertising. However, in a niche like ours, with just 2% of companies as a target, we need a very targetted approach to our marketing. This could be by identifying and contacting companies that look similar to the kinds of businesses that already use the services that we sell. For example, the percentage of recruitment companies that use invoice finance is quite high, closer to 17% (20 times the average), hence targetting recruiters could be a good start (but an obvious one as well). We could then consider media that will enable us to reach this target audience. For example, we might consider advertising in a recruitment magazine, or via an online recruitment publication. Alternatively, we might contact those customers via direct marketing such as a mailshot or phone call. This is a very basic example of data mining. Data agencies will be able to profile existing customers that are using your services, and identify others that look similar in terms of key metrics. This enables you to target customers that look similar to your existing clients. The method of contact can then be tailored to your audience. It sounds counter intuitive but it is worth keeping a dialogue going with your peers and competitors. Often other similar organisations are happy to discuss aspects of how they undertake their own marketing, of course you have to watch out for red herrings, but you can pick up some useful tips. Don't be afraid to ask for specific details, people are often happy to speak about campaigns they feel have been successful. Similarly, they might tell you of campaigns that have not been successful, which can prove just as useful. Sometimes you have to trade some information about what you are up to, but you don't have to give away all your trade secrets, just a flavour of how you are marketing you business. For example, if you tell someone you have had some success with direct mailing to prospective clients, it really doesn't help them that much unless they know the details of the wording for the mailing that you have used and they also know exactly how you have targetted and constructed your mailing list. More to follow . . . If you need some marketing help please contact us on 03330 113622.